From January through December, let's take a look at what Washington and Oregon has to offer this year. Here's a month-by-month look at the best fishing hotspots this year in Washington and Oregon. Some fishermen believe only cold-water fish swim in Oregon and Washington lakes, rivers and streams. Truth be told, an incredible variety of cold-water, warm-water and saltwater fishing keeps local anglers busy all year. And a fishing license will lead you to any and all of them! Long known for giving up big rainbow trout ranging into the upper teens, Rufus Woods is a 51-mile remote reach of the Columbia River flowing between Chief Joseph and Grand Coulee dams. Much of the fishing centers around the hatchery net pens where rainbows gather. Boat access from the south is a 40-mile slog upriver. A shorter run but a longer trailer haul is from the north by launching at Seatons Grove. Try Pautzke’s Fire Bait or a night crawler on a slip sinker, crayfish- or sculpin-patterned flies, or a brown Rooster Tail. OTHER OPTIONS: Alsea River, OR, Steelhead: Use corkies with a piece of bright yarn, eggs or even a sand-shrimp tail. Cottage Grove Pond, OR,Trout: This urban pond in Row River Nature Park features a fishing dock and plenty of trout. 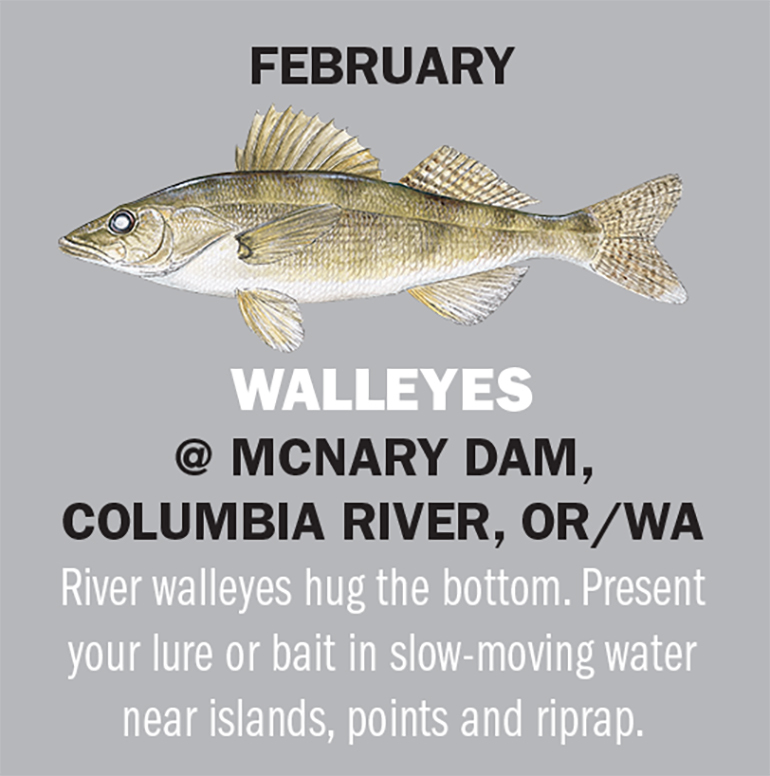 The Columbia River draws anglers to the water downstream from McNary Dam with hopes to hook into the big river’s big, spawning female walleyes that prefer the slow-moving water in this stretch. The Washington Department of Fish and Wildlife reports several fish weighing over 18 pounds have been caught in the area, including the 20.3-pound state record in 2014. Focus on current breaks created by islands, points, riprap and inside bends. Worm harnesses, stickbaits and crankbaits all work. Plenty of boat access sites lie on both sides of the river, where a valid fishing license from Washington or Oregon is acceptable when boat fishing. Shoreline anglers must carry the appropriate state license. OTHER OPTIONS: Umpqua River, OR, Steelhead: Find good boat access from Elkton downstream to Sawyer’s Rapids for big fish. Puget Sound, WA, Trout: Cast small Clouser minnows in pink/white or chartreuse/white at this catch-and-release fishery. Expect plenty of feisty 16- to 18-inch rainbow trout on the opener in this desert “seep” lake. Lenice has proved to be a consistent early season producer. Designated by the WDFW as a “selective gear” fishing site, anglers are limited to fly-fishing or lures with single-point hooks only. Float tubes or small pontoon boats make access easy beyond the heavy shoreline vegetation. Other nearby trout-fishing options — Merry Lake and Nunnally Lake — can make it a weekend destination. Primitive camping is allowed in the parking lot but bring your own water. OTHER OPTIONS: Row River, OR, Trout: Close to the Eugene metro area, the river runs low and clear before spring runoff. Coffeepot Lake, WA, Trout: Cold weather means the trout will be deep, eating red or black chironomids. 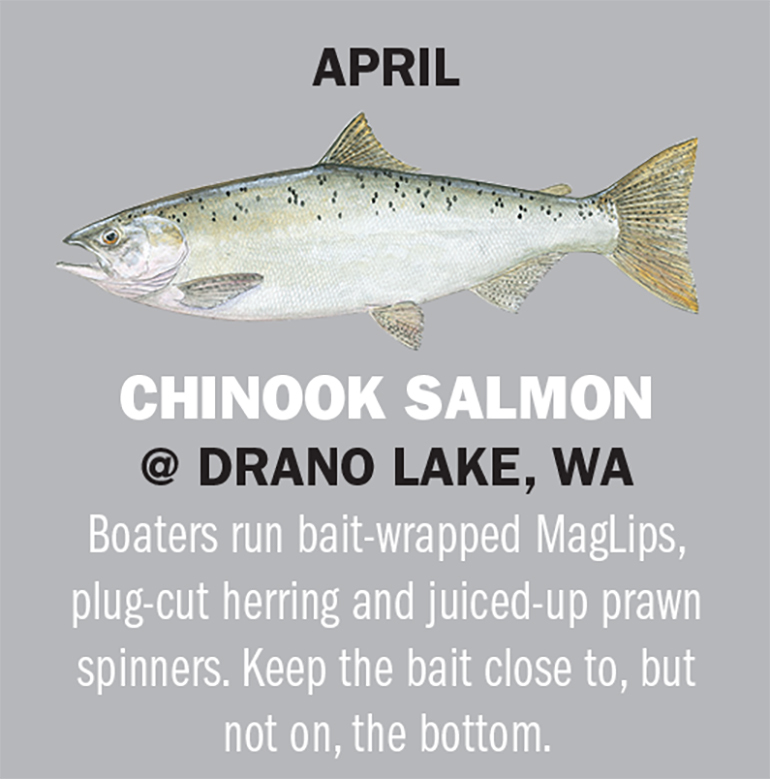 Some say Columbia River springer Chinooks are the best-tasting fish in the river. Drano Lake is the best place to catch them! Formed by Bonneville Dam and fed by the Little Wind River, this backwater of the Columbia River collects Chinooks that leave the riverway, swim under the bridge, and come face to face with bank- and boating anglers. Boaters run bait-wrapped MagLips, plug-cut herring and juiced-up prawn spinners. Keep the bait close to, but not on, the bottom, as Drano is filled with gear-wrecking woody debris. Troll in an east-to-west pattern, or you’ll be met with tangled lines, harsh words and, perhaps, more. OTHER OPTIONS: Umpqua River, OR, Chinooks: The river, from its mouth upstream to Scottsburg, fishes best from a boat. Deschutes River, OR, Trout: The lower river redband trout take flies, and holdover summer steelhead can make things interesting. The lower 40 miles of the Yakima River, from Prosser to its mouth at Kennewick, is smallmouth country. Bounded by private land, the upper river is accessible by launching inflatables via rough sites ferreted out with GoogleEarth. From Prosser to Chandler Powerplant, the river can be shallow, rocky and rarely gets fished. Several state-maintained, water-access sites lie downstream from Horn Rapids. When the temperature trends upward and the flow is reported less than 4,500 cfs at the USGS gauge at Kiona, the smallmouths come to spawn and intercept the fall Chinook fry heading down to the Pacific. The river fishes best from a boat, as private land restricts bank access to areas around boat launches. Horn Rapids Park is a great home base while fishing the river. OTHER OPTIONS: Davis Lake, OR, Trout/Largemouths:. Davis was traditionally a trophy rainbow-trout lake until largemouth bass were illegally introduced. Now this fly-fishing-only lake supports both. Galesville Reservoir, OR, Mixed Bag: Target trout, landlocked coho salmon, and largemouth bass. Not many trout waters boast average-sized rainbow trout that measure 24 inches. Welcome to Upper Klamath Lake! Stretching across more than 60,000 surface acres, the huge, shallow lake in southern Oregon is dangerous to man and beast when the winds kick up, signaling sane anglers to rush for shelter. But when the weather gods smile upon the lake, big rainbows leave the warming lake behind and head for the feeder creeks. While staging to enter the colder water, they feed upon a variety of food. Boaters do well to work the water at Pelican Bay, swing their crafts toward the buoy off the entrance to Crystal Creek, or run the other way into Recreation Creek. Most fishermen will be tossing Kastmaster spoons or flies of various types. OTHER OPTIONS: Umpqua River, OR, Shad: The shad run on the Umpqua is more than worth the shot, from Umpqua down to Scottsburg. 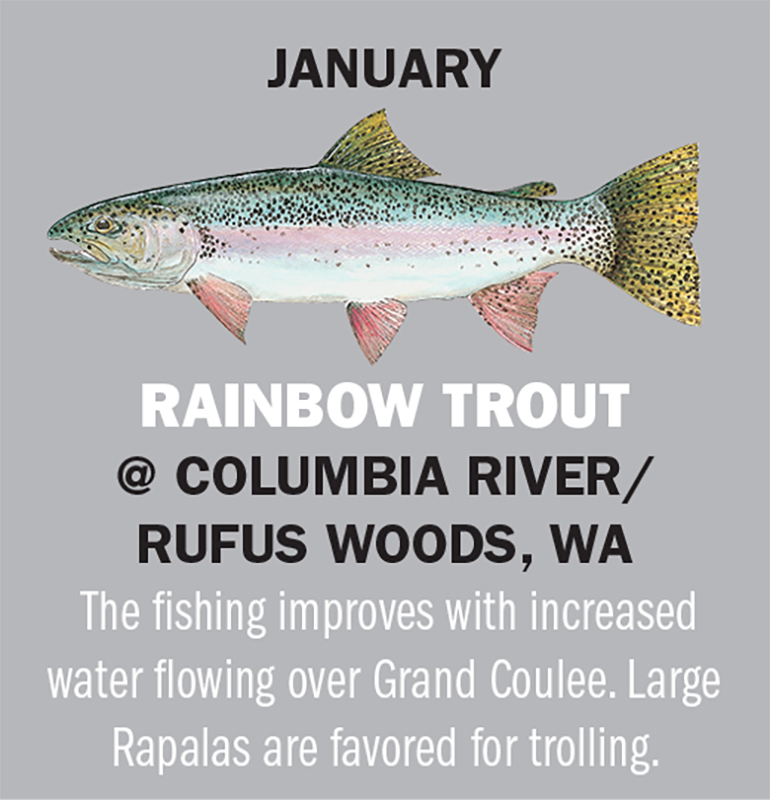 Rufus Woods/Columbia River, WA, Trout: At 55 miles long, it’s filled with rainbows that love crayfish. Channel catfish of Brownlee Reservoir are often overlooked by Oregon’s angling population. This time of year, they become very active in the 50-plus-mile-long impoundment of the Snake River, on the move looking for food, sometimes even feeding on the surface. It can get downright crazy when the Mormon crickets end up in the water! Gear fishermen favor all manners of bait — Mormon crickets, chicken livers, worms and shrimp. Expect to catch channels up to 15 pounds, so leave the light trout rods at home. The reservoir also holds even bigger flathead catfish that push the scale to 60 pounds. The Powder River Arm, out of Richland, features two campgrounds and three concrete boat launches. The community of Huntington offers access at the upper (southern) end. The graveled Snake River Road connects Richland to Huntington, with some boat access sites and tons of bank access. OTHER OPTIONS: Hosmer Lake, OR, Trout: All the pleasure boaters are a pain but the fishing for rainbows, cutthroats and brookies is worth the hassle. Lake Chelan, WA, Lake Trout: Go deep with Silver Horde Kingfisher Lite spoons during the evening in Manson Bay. August brings Chinook salmon fishermen to Buoy 10 on the Columbia River. Once the season opens, the salmon move through, but the tide is key to experiencing a good bite. Try to be on the water on the days with a high tidal exchange. All that moving water prompts big numbers of fish to move upstream. Begin near the buoy at low to slack tide and work upriver, essentially back-bouncing as the tide pushes the boat along with the fish. When the tide reverses, and the fish stick their noses into the out-flowing water, troll downstream with the river current at areas of “soft,” slow-moving water. OTHER OPTIONS: Merrill Lake, WA, Trout: The hexagenia hatch on the fly-fishing-only lake is pure chaos and great fun. Lower Granite Lake, WA, Smallmouths: This Snake River impoundment gets little pressure. Irrigation season is over, and water flows on the Yakima River will drop from 4,000 cfs in July to around 1,500 cfs as summer closes, making wading easy again as rainbow and cutthroat trout settle into their low-water holding sites. Early in the month they will still be under the overhanging grassy banks; later, they move into mid-river lies to take advantage of the deeper water. If the air temperature spikes up, they will move into the riffles for the oxygenated water. If fishing and floating the upper river, care must be exercised downstream from Bullfrog and into the Farmlands. Beavers are always re-arranging the cottonwoods to create strainers, sweepers and other river hazards. If you wonder what fly to use or where to go, stop in at one of the several fly shops in Cle Elum, Ellensburg or in the Yakima Canyon, or hire a guide for the day. OTHER OPTIONS: Willamette River, OR, Trout: The Willamette holds plenty of rainbows and cutthroats that see little pressure. Banks Lake, WA, Walleyes: Try pulling Shad Rap or similar cranks so they dive about 12 feet for late summer walleye. Lively summer steelhead have bailed out of the Columbia River and are heading upstream into the John Day. This is a mixed hatchery-wild fish run with special rules to protect the wild fish. The best access on this remote river begins at Cottonwood State Park, which opens up miles of bank access, where a gravel trail runs downstream on the bank opposite of the park. Drift boats and rafts can launch at nearby J.S. Burres State Park and float downstream to Starvation Lane or stay on the river until Rock Creek, which also affords miles of walk-and-wade fishing. Expect cool water and cold weather, as the sun rarely heats this canyon this time of year. A Columbia River endorsement is required in addition to the proper fishing license. 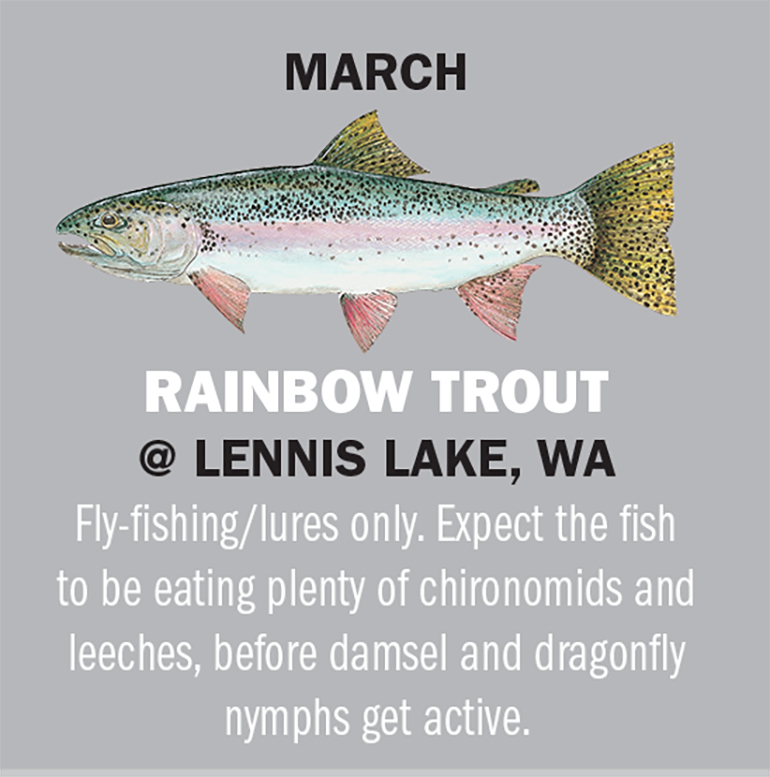 OTHER OPTIONS: Lake Sammamish, WA, Trout: Trolling for coastal cutthroat can produce fish ranging up to 20 inches. Chico Creek, WA, Chum Salmon: Some anglers favor the incoming tide; others like the outgoing for these terrific fighting fish. This is the river of giant Chinooks and beautiful country. Every year fish larger than 50 pounds are landed. An average Chinook here runs 20 to 25 pounds. In early fall, the run reaches the estuary, moves through tidewater and comes into its own when the fish move into the river. Gear restrictions are lifted in November, opening plenty of fishing options, from back-bouncing roe to running plugs. Go big on the plugs and wrap them with fillet. Boat access is good along the river, with a no-motors restriction upstream from the Rogue-Siskiyou National Forest boundary. Fly-fishermen get their share of fish, using 9-or 10-weight rods and sinking lines. Most of the fishing pressure takes place downstream from the second bridge where the designated “wild and scenic” section starts. In the upper river, fish tend to hold in pools that sometimes make for better catching. OTHER OPTIONS: Cowlitz River, WA, Coho Salmon: A late run of cohos make it into the Cowlitz. It’s a good bet for those fishermen still needing their salmon fix for the year. Lake Washington, WA, Yellow Perch: The fish have moved deeper as the water cools, but this still could be the best perch fishery in the state. In 1968 the Colville Tribe stocked 325 pure-strain Lahontan cutthroat trout in alkaline Omak Lake. Those fish survived, and the lake was destined to become a trophy Lahontan cutthroat fishery, opening to the public in 1975. The cold water of the winter months bring the fish out of the depths and into the shallows. That’s important, given the geography of this 8-mile long lake, bounded by steep and rugged banks. The lake can be accessed at the north and southern ends but nowhere in between. Some fishermen wade the shallows; a few bring some type of casting platform like a step ladder. Others fish from small pontoons. Redside shiners grow in abundance. Anglers must purchase a Colville Tribal fishing permit. OTHER OPTIONS: Clackamas River, OR, Steelhead: Focus on the lower river from River Mill Dam below Estacada down to the mouth. Fourth of July Lake, WA, Trout: Managed as a put-and-take lake, it regularly produces 20-inch rainbows.